Mason County has over 60,000 residents and is located along the western edge of the Puget Sound in northwestern Washington. It is situated between the Olympic and Kitsap Peninsulas at the southern end of the Hood Canal, and incorporates Harstine Island. While the county is known for its timber and shellfish industries, it is also a popular tourist destination. Its position on the Puget Sound and Hood Canal is perfect for kayaking, boating, fishing, clamming, and scuba diving. Its convenience to the Olympic National Forest means plenty of hiking, biking, and nature trails Pacific Northwesterners love, and the county itself has multiple parks, golf courses, and wineries. 3 Beds | 2.75 Baths | 2392 sq. Ft.
3 Beds | 2.75 Baths | 3216 sq. Ft.
2 Beds | 2 Baths | 1488 sq. Ft.
3 Beds | 1.75 Baths | 1134 sq. Ft.
3 Beds | 2 Baths | 1970 sq. Ft.
3 Beds | 2.5 Baths | 1474 sq. Ft.
2 Beds | 1.75 Baths | 1356 sq. Ft.
1 Beds | 1 Baths | 564 sq. Ft.
2 Beds | 2.5 Baths | 1710 sq. 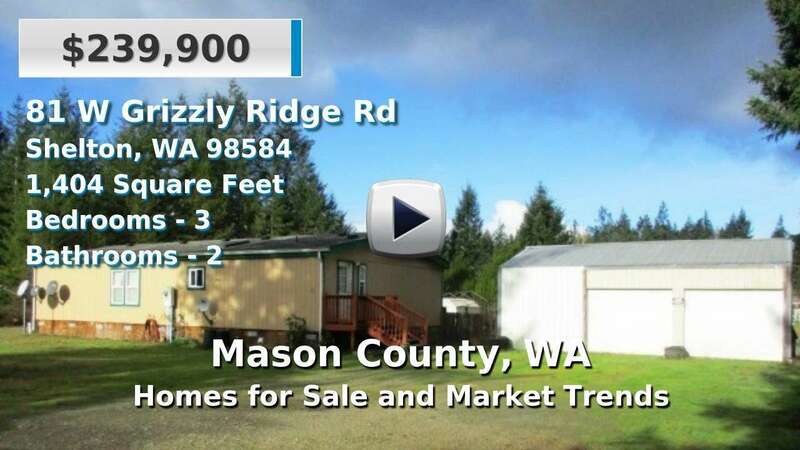 Ft.
Blue Summit Realty has the most accurate and up to date Mason County real estate listings on the web. Currently there are 196 homes for sale, 1 condos for sale, 12 rental properties, and 517 vacant land properties in Mason County. Of the 727 total Mason County residential listings for sale 6 are bank owned, 2 are short sales and 14 are new construction and 0 are townhomes. The price ranges from $40,000 to $3,450,000 with a median list price of $361,383 and median sold price of $247,045. Make sure to refine your Mason County real estate search by property type, price, square footage, bedrooms, bathrooms and more with the search tool above or view the Mason County listings on our interactive map. Our Mason County real estate listings were updated 12 minutes ago.